Want to sell your junk car for cash in Wisconsin? The Clunker Junker can help. We pay cash for junk cars in Wisconsin and give instant offers up to $10,000! Are you a Cheese head looking to get cash for cars in Wisconsin? If so, you’re in luck. Muck like how Wisconsin is the top dairy producer in the country, we’re the top junk car buyer! At The Clunker Junker, we firmly believe that we are one of the top junk car buyers in Wisconsin because we strive to pay you a fair price, offer outstanding customer service and, leave you feeling happier and richer. I’m talking Bellavitano style of cheese kind of rich. Have you been to Plymouth, WI and tried this stuff? So delicious, you’ll act like the former Wisconsin resident Harry Houdini, and make it disappear instantly. That’s basically what we want to do with your junk car, except we’ll leave you with cash! We’ll send out a team to pick up the vehicle free of charge and pay you in cash upon collection. That’s free junk car removal! America’s Dairyland is beautiful and has plenty of countryside. So unless you’re part of the 30 percent of the population living in the greater Milwaukee area that can make it challenging to find a qualified buyer or junkyard especially if you’re selling a junk car rather than a used or new vehicle. No need to fret. We buy junk cars all over the great state of Wisconsin. So whether you’re taking a tour of Cedar Grove Cheese facility or staring at the Fox River and trying to figure out how it’s flowing north we can help you out when the urge to junk your car hits. Dairy isn’t your state’s only claim to fame. We’ve heard all about just how much ginseng, cranberries, and bratwurst Wisconsin produces. You’re leading the nation! We strive to be just like the great people of Wisconsin. Not only do we buy junk cars, but we also buy cars that aren’t junk. Maybe you’ve got a car that’s painted in Packers colors and the wife said it needs to go, or your car has just been sitting around unused. We’ll make you an offer on those too! When Wisconsinites do something, they do it well. Same here! We have a very efficient cash for cars junk service in Wisconsin, sometimes picking up a vehicle on the very next day after you agree to our price. The Clunker Junker is all about simplicity, which is why you can get a quote for your car by filling out our online form and then earn a paycheck without ever needing to leave your house. That’s useful when it’s tourist season, or the dead of winter! Burrrrr….it feels like the Wisconsin Glacial Episode all over again. Even for vehicles in a terrible condition, we’ll give you cash for junk cars. There may even be options for you if you don’t have your title! Regardless of if car is just getting old, or completely rusted out we’re here to make you a cash offer! It’s our goal to pay top dollar for junk cars regardless of whether they are only lightly used or more closely resemble raw metal than a vehicle. We’ll buy your junk cars for cash and pick it up free of charge from your home or an auto salvage yard without you needing to do anything other than fill in our quote form and accept our offer. As Wisconsin junk car buyers we buy vehicles that are broken and wrecked, but we’ll also pay you cash for cars that are in a far better condition as well. To find out how much you could earn for your car, fill in our quote form and let’s get the ball rolling. In most cases you'll get an instant offer for your junk car. After we’ve agreed to a price, we’ll send out our junk car removal team team to pick up the car from wherever it’s located, plus the collection team will pay you cash for junk cars in Wisconsin. That’s right, we come and pick up the clunker and get it out of sight for you. No need to hire a tow company or worry about handling it yourself. Of course, this is all included in your offer and there are no hidden fees or charges. Our customers are often surprised at how much we’ll pay them for their vehicles, even if they are in a dreadful condition. Whether your car is rusted out and rotting away, or only very lightly used we’ll make sure that you’re paid a fair price. Even for cars that are barely standing (or aren’t! ), we’ll still ensure that you get paid a fair price. These cars are typically worth between $50 and $225 depending on their weight in scrap metal. A fairly large proportion of the cars that we purchase are neither junk nor used. Instead, they are somewhere in-between. Typically these cars don’t operate, but they might still have some working parts which could be sold at an auto salvage yard or online. Finally, we also buy used cars which are still trucking along and for which we’ll pay you handsomely in cash (sorry, no cheese here!) or a check. Depending on the make and model of your used car you could earn up to $10,000 and be paid the very next day after agreeing to our offer. 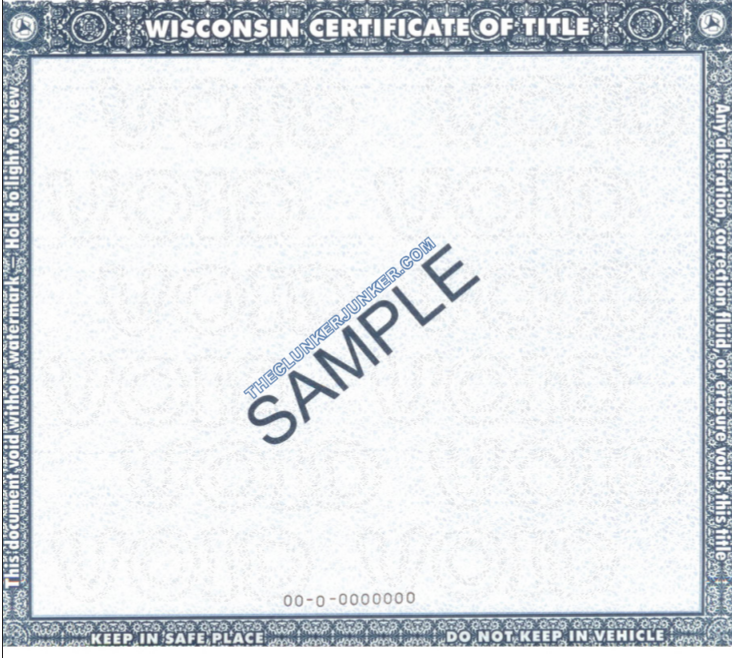 We have put together a simple guide and example for how to sign your Wisconsin title when you are selling your vehicle. If there are multiple owners listed on the title, they must all sign the title unless the names are separated with "OR". 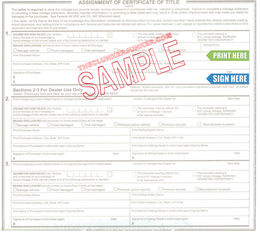 When signing a Wisconsin title, flip it over to the back and look for the "Assignment of certificate of title" section. It's at the top and hard to miss. Make sure you only sign and print in section "1". Leave sections 2 and 3 empty or you may end up needing a new title. First, sign the back of the title where indicated by "Signature of Seller(s)"
Next, print (don't sign) your name on the back of the title where it reads "Print Seller Name". Complete the online title request form. 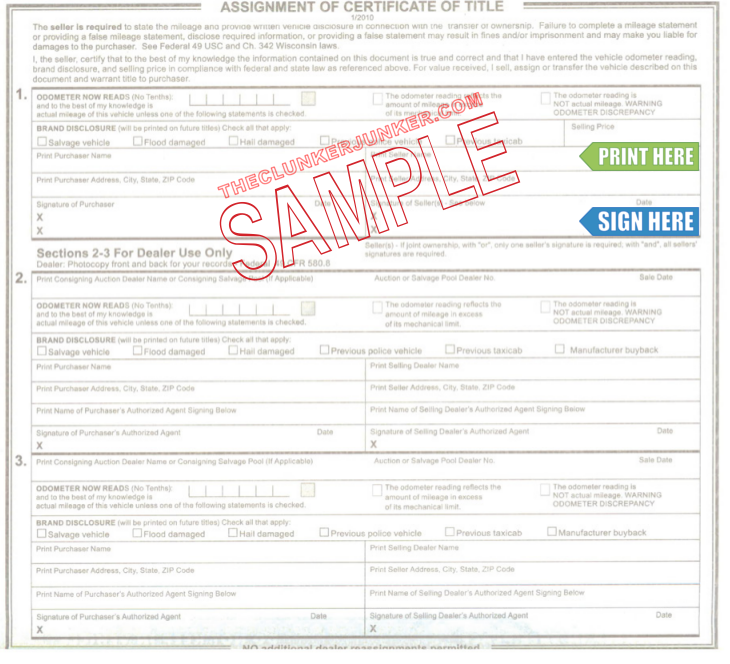 Alternatively, fill out the physical Wisconsin Replacement Title Application. Please note that there is seven to ten day waiting period before a duplicate title can be issued and the cost is $20.50 (An additional $5.00 counter service fee applies in person). Getting rid of an abandoned vehicle in Wisconsin can be a difficult process. Unfortunately, you cannot just sell any junk car that ends up on your property if you do not own it. You'll need to follow the Wisconsin abandoned vehicle removal procedures. We have given a general overview of what that entails below. Once an offer has determined the abandoned status of the vehicle, they will dispatch a tower to remove the vehicle. A notification of seizure must be sent within (10) ten days of removal. After (10) ten days of certified mailed notification, the vehicle may be sold, donated, or disposed of. Would you still buy my car if I didn’t have my Wisconsin title? We can buy some cars without title, but not all. There may be restrictions on age and location. Our buyers who are willing to purchase without title will require you to prove that you own the vehicle. This is usually done by showing a valid registration that matches your photo ID. Also, no title offers are almost always lower than offers with title. 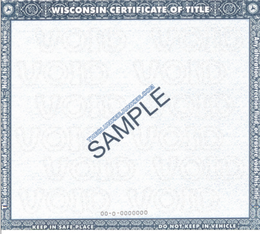 Wisconsin often changes their title documents from year to year. If you have questions about your specific title, please contact your Wisconsin DOT. Selling a junk car shouldn’t be hard but dealing with junkyards can be challenging to say the least. Instead, sell your junk car in Wisconsin to the Clunker Junker by filling in our quote form today. Find out how many pounds of delicious Wisconsin cheese you can buy with your new paycheck by getting a quote from the Clunker Junker! "I'm not sure of the dents, damage or rust. The front windshield is cracked. I'm junking it because the passenger-side front rotor is broken, but it's still driveable with very little braking. I cannot remove the hub nut. Also, the rear driver-side door will not open." "The hood has flown off, but I have it bolted down. It will start, but I don't know about driving it. I think it has blown a rod in it, and something is wrong with the heads." "The transmission died on the car about a year ago. The battery is dead. Otherwise, the car is in good shape. The motor was fine at the time, and all of the glass is intact. The leather interior is fine. Other than the transmission, the car was fine when the transmission died." "The car runs hot. I have parts for repairing it. I bought the car offline from a lady, and it broke down. I have the bill of sale, but the title is not in my name. " "The vehicle had a new battery, clutch, flywheel and shifter cables installed in October of 2015, and it won't start. I have already put over $2,500 into the car, and I don't want to spend any more on it." "It's a great truck. It's a 4x4. I have a Lexus now. It would start with a new battery and possibly a fuel stabilizer. I drove this car for 70% worth of the miles on it. It was given immaculate care until the minor accident with the hatchback. That's the only damage to the vehicle. I'm an attorney and happy with my coupe. I'd like this out of my driveway, but I'd like someone to recognize the amount of care I took with this car. It's actually a gem, but it has been sitting like this in my driveway since November. " The Clunker Junker is one of the top junk car buyers in the state of Wisconsin. To date we have made instant offers on over 10 thousand vehicles across the state, totaling over $3.2 Million offered! Of those vehicles, approximately 10% were purchased without a title. We also buy cars on a wide spectrum of conditions and 53% of the vehicles we've made offers on in Wisconsin do not start or drive. Many also have moderate to severe body damage. Milwaukee in Milwaukee County/Washington County/Waukesha County was our top producer, followed by Madison.